What makes Longvida Optimized Curcumin Capsules Unique? Longvida® Optimized Curcumin is a breakthrough formula of the natural antioxidant curcumin, from the turmeric root. It is optimized to deliver free curcumin into target tissues through the critical bioavailability requirements of permeability, solubility, and stability. Developed in collaboration with neuroscientists at UCLA, Longvida® carries a strong safety profile and is self-GRAS. Longvida is the only curcumin supplement in the world to use SLCP™ Technology, which is the only process demonstrated to increase curcumin absorption and bioavailability to effective levels in humans. The SLCP creates a lipophilic matrix surrounding the curcumin, which not only protects the curcumin inthe GI tract, but improves its ability to absorb through lipid membranes and the blood brain barrier. 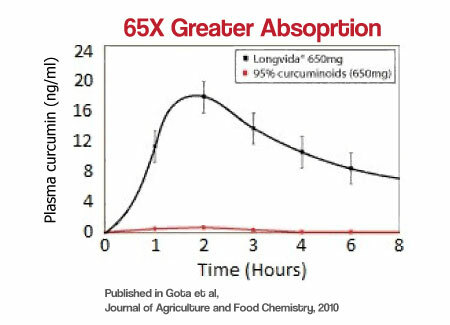 Why Choose Longvida as your Curcumin Supplement? Free Curcumin - Delivers efficacious free curcumin into the bloodstream, target tissues, and across the blood-brain barrier for a full 24hrs of circulation. 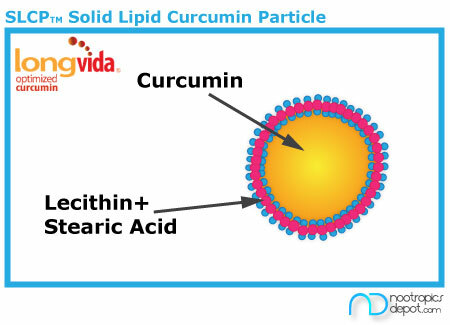 Unique Technology - SLCP™ Technology protects the curcumin in Longvida from being rapidly broken down and excreteted. This allows for 24-hr circulation in the blood and tangible health applications. Resarch - Longvida® is a breakthrough formula containing the natural antioxidant curcumin, and is optimized for maximum targeting of curcumin into blood and tissues. It was developed by Verdure and an elite group of university neuroscientists at UCLA. Longvida® took many years to develop and perfect. As a dietary supplement, take one 400mg Longvida Curcumin extract capsule once daily. To learn more about Longvida Curcumin, see the customer reviews and experiences below. Nootropics Depot offers a 30ct. or 90ct. jar of Longvida Curcumin Extract capsules. Nootropics Depot's Longvida Curcumin has been has been lab-tested and verified for both product purity and identity. You may also like our Longvida Curcumin Extract Powder. Attention: These statements have not been evaluated by the Food and Drug Administration. These products are not intended to diagnose, treat, cure, or prevent any disease. Very high quality curcumin product! I read that curcumin can help with depression, and I suffer from severe, treatment resistant bipolar depression. I have tried several curcumin/turmeric products before, some helping a little, some not helping at all, but this product I could really tell was helping my depression a good bit. I definitely would recommend it at least for this indication. I am a great believer of Curcumin and this product is the best I have taken. Not noticeable that it is working until you realize that those chronic stiff or sore areas are not there any longer!